Open Source SDR Web App for Everyone! Test original OpenWebRX receivers! Get it from GitHub! Do you want to share your SDR receiver with other amateur radio operators? Let's build a network of remotely controllable SDRs together! Step 2: Share your receiver on sdr.hu! I have written my thesis on OpenWebRX for my Bachelor's degree in electronic engineering. It contains some additional implementational details on both the web interface and the DSP algorithms. You can also find my MSc thesis online about digital demodulators in OpenWebRX. I presented OpenWebRX and csdr at the TAPR Digital Communications Conference 2015 in Chicago, IL. I would like to say a really big thanks for this opportunity to Steven Bible, N7HPR and Tucson Amateur Packet Radio Corp, and also to Gary Pearce, KN4AQ for making the video. 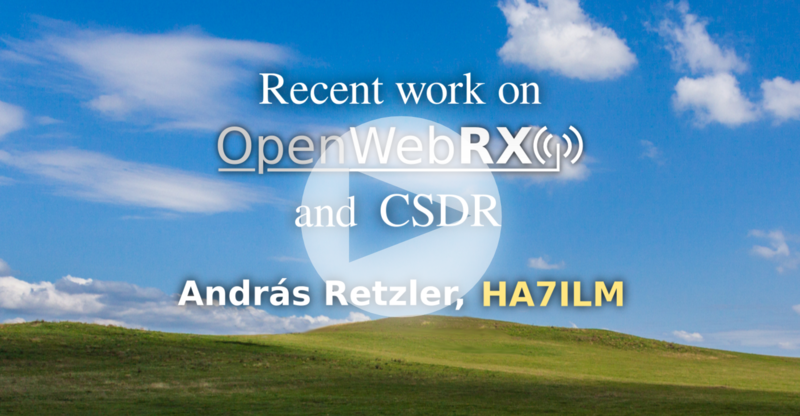 If you have any questions regarding OpenWebRX, you can contact the developer, András Retzler (HA7ILM).